The chronophage clock is one of only four in the world. A marvel of science and art, it features the historic grasshopper escapement invented by British clockmaker John Harrison in 1722. The escapement “pushes” the pendulum, releasing each second with precise control. Traditionally inside a timepiece, Taylor enlarged it for the viewer to see in motion. The grasshopper escapement solved a major problem in 16th century marine navigation. Seafarers determined their longitude by comparing local time to a clock set to the “base time” at their home port, but clocks proved untrustworthy on rolling seas. Harrison’s escapement helped create marine timekeepers that remained accurate in spite of tossing. 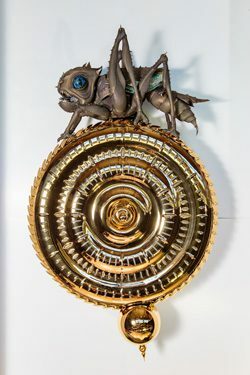 Part insect, part reptile, the chronophage represents the looming presence of wasted time. Every 60 seconds, she opens her mouth to devour the passing minute. She appears weathered, but her lacy enamel wings suggest she was once beautiful. Every hour, she stretches her titanium body, her glass eyes light up, and she warbles the Westminster Chimes, voiced by Scottish Opera singer Kate Valentine. From outer to inner, the rings light up to count seconds, minutes, and hours. To learn more about how the chronophage clock tells time, please click here. Taylor used explosive hydroforming to shape the clock’s gold-plated face. Underwater, a precision explosion forced a sheet of stainless steel into a pre-cut die. Photos courtesy of Laurie Perez.